LT Awards judges describe custom digital learning provider, Sponge, as “the most inspirational organisation” among the 2018 finalists. Custom digital learning provider, Sponge, has won silver in the coveted Learning Technologies Company of the Year category at the 2018 LT Awards. 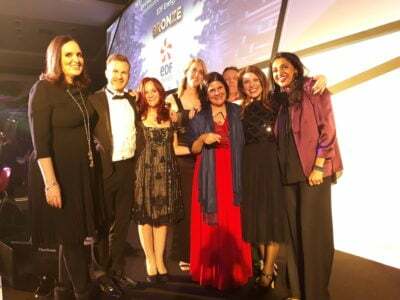 The award was announced at a Gala Evening at Park Plaza Westminster Bridge Hotel in London on 21 November 2018. The award recognises the company’s innovation and creativity in providing inspiring workplace learning that delivers exceptional results for clients. An independent panel of L&D professionals was impressed by a string of testimonials and measurable results from Sponge’s clients, including AstraZeneca, AXA, Royal Mail, Tesco, and Marks & Spencer. In the award citation, the LT judges said they were impressed by Sponge’s “commitment to creativity”, describing the company as “the most inspirational organisation” they saw among the 11 finalists in this year’s category. One testimonial presented to the judging panel came from global insurance firm, AXA. Sponge used blended learning to embed world class customer service at the company’s contact centre for business customers. Within months of completing the training, positive customer comments had more than doubled and complaints were cut by a quarter. The award reflects the way that Sponge works in partnership with its clients to understand their business challenges and solve their unique learning needs. One of Sponge’s learning innovations that made a real impact in 2018 was its virtual reality (VR) training to increase dog safety awareness amongst Royal Mail postal workers. The Learning Technologies Company of the Year Award is the latest success for multiple-award winning Sponge. The company has grown to be one of the largest custom digital learning companies in Europe, while retaining its reputation for creativity that meets serious business objectives. The company was founded in 2004 and has since grown to 116 employees. Headquartered in Plymouth, the company has expanded to open offices in London, Dublin, Nottingham and most recently Bristol. The company has established an Innovation Department to focus on applying emerging technologies to workplace learning, and Sponge University, an internal programme for developing talent. In the next five years, Sponge plans to expand its team to 300 people and open new offices in Europe and the USA.